Since the introduction in 1973 as the UNECE Recommendation No. 1, the UN Layout Key (UNLK) has provided Governments, organizations and the business community with a basis for a standard and aligned design of documents used in trade and transport. 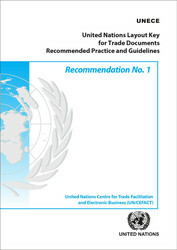 This has led to a major improvement in the standardization of trade documents in many countries throughout the world. Most international organizations re-designed their relevant documents on the basis of the UNLK. Moreover, private companies also historically opted for the UNLK design for “one run” reproduction techniques, but also for ease of understanding of the information within the documents. The reductions in time and cost for the paperwork involved in moving goods in trade have been significant. The use of UNLK contributes to the United Nations Sustainable Development Goals. The use of UNLK contributes to creating a resilient infrastructure for sustainable trade, ensuring that all documents are coherently understood and allowing processes to be automated. It reduces inequalities within and among countries as it provides a base standard accessible to all. Finally, it strengthens the means to implement partnership for sustainable trade by promoting a universal, rules-based, open, non-discriminatory and equitable multilateral trading system. Further guidance on the use of the UNLK was provided in a 1981 revision of the recommendation and then enhanced with a series of examples in a 1984 Guideline. It was further completed by an addendum in 2001 and a Guideline for Application in 2002. At the launch of the current revision, there were several guidance documents each contributing to different aspects of implementation of the UNLK. This current text aims to consolidate all of these into a single, comprehensive text. It clarifies certain aspects of implementation and provides further guidance on the relationship with dematerialized versions of the UNLK.